Tokyo, May 28, 2010: For the fifth year running, Japan Airlines (JAL) will conduct a mileage campaign in the Environmental Month of June, to support the “Inner Mongolia Greening Project Against Desertification” organized by the non-profit organization OISCA* International. Titled “JAL Miles for Eco”, the mileage drive allows members of JAL’s frequent flyer program - JAL Mileage Bank (JMB), the opportunity to donate their mileage to this worthy cause. Between June 1 and July 31, 2010, members can contribute in units of 10,000 miles, where 1 mile is equivalent to a donation of 1 yen to this project. Mileage donations can be made through the website for Japan-registered JMB members and through regional JMB call centers for overseas members. Environmental preservation continues to be a key management issue for the JAL Group who was recently acknowledged by the Japanese Ministry of Environment as an Eco-First company. JAL will persevere in its various conservation activities and also seek to raise awareness about the environment among its customers by engaging them in green efforts such as the “JAL Miles for Eco” campaign. Donations will be reflected in the JMB mileage statements as “JAL Miles for Eco” or “MILEAGE DONATION FOR ECO-CHINA”. OISCA's Inner Mongolia Greening Project Against Desertification aspires to curb increasing desertification and to mitigate damage caused by the clouds of yellow sands created by the desertification. The gradual encroachment of the desert is leading to soil degradation of the grassland and farmland which local habitants rely on for their livelihoods. Clouds of yellow sand cause sand storms across China and reach other countries, including Japan and Korea. The sand storms pollute the environment and can, for example, lead to respiratory health problems in humans, and damage the health and habitat of wildlife. Launched 7 years ago, the project focuses on the Alxa (Arashan) region in Inner Mongolia where, during the past decade, up to 1,000 square kilometers of land has become desert due to adverse climate changes, rivers drying up and overgrazing. Working closely together with local communities and government, the project aims to create a green belt that will curb desertification in this dry region through reforestation, the development of greenery planting techniques, environment-awareness building activities with the local population, and the creation of a locally supervised self-reliant and sustainable anti-desertification program. 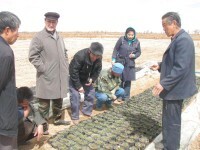 With the financial support of JAL and other participating organizations, in October 2006 OISCA opened in the region the Arashan Desert Ecological Research and Training Center to act as a base for its greening projects and environmental education programs. Now that the center has been established, OISCA plans to accelerate its reforestation projects, and initiate projects for composting, developing water-saving technologies and the utilization of renewable energies. It also plans to develop and introduce cultivation methods for some medicinal plants as a means of enhancing the livelihood of local people.